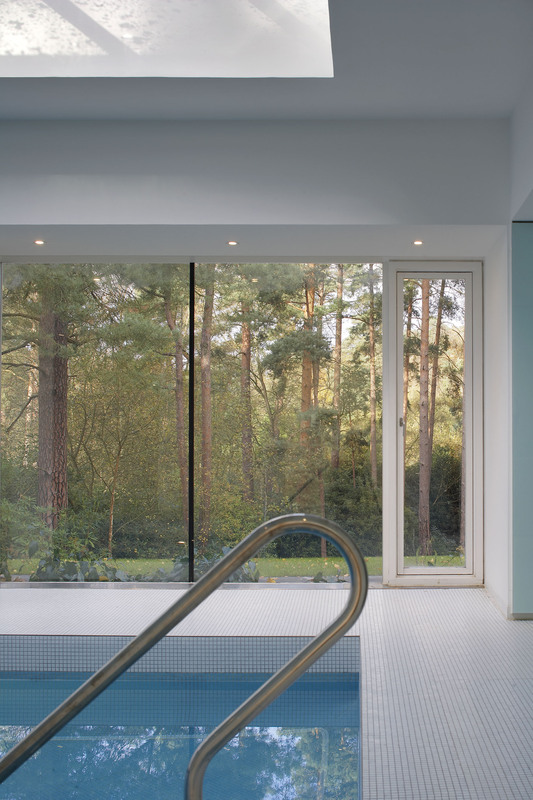 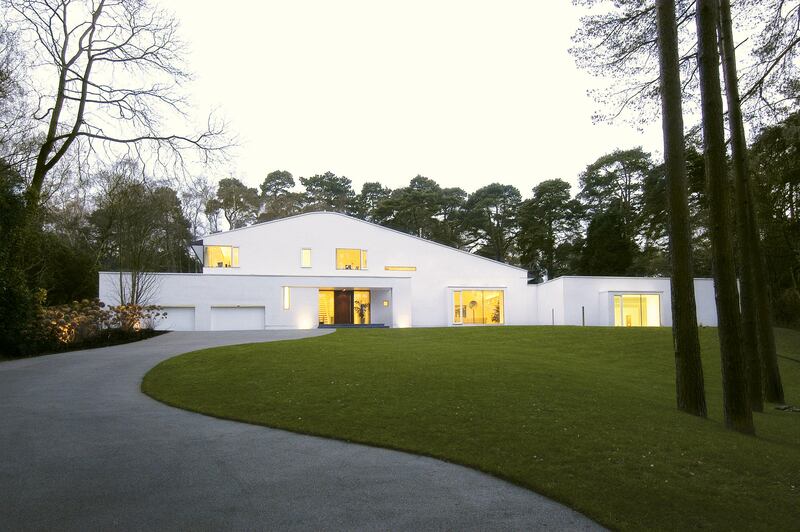 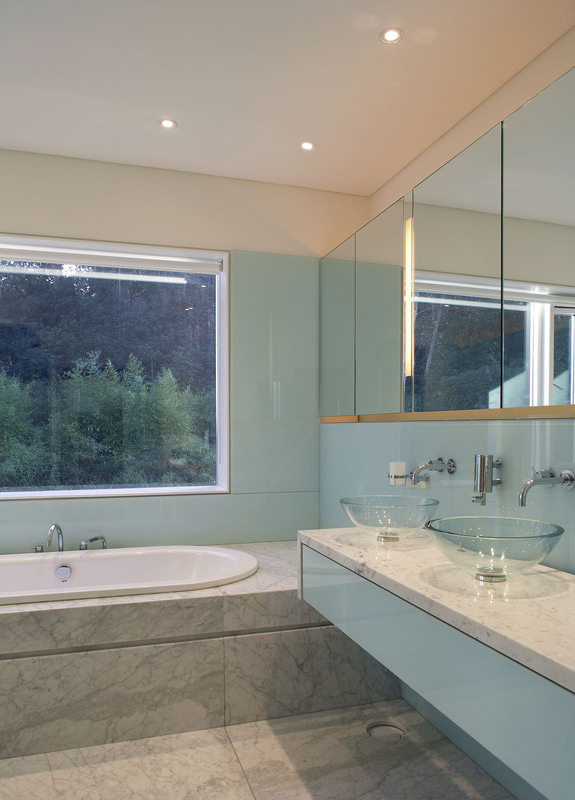 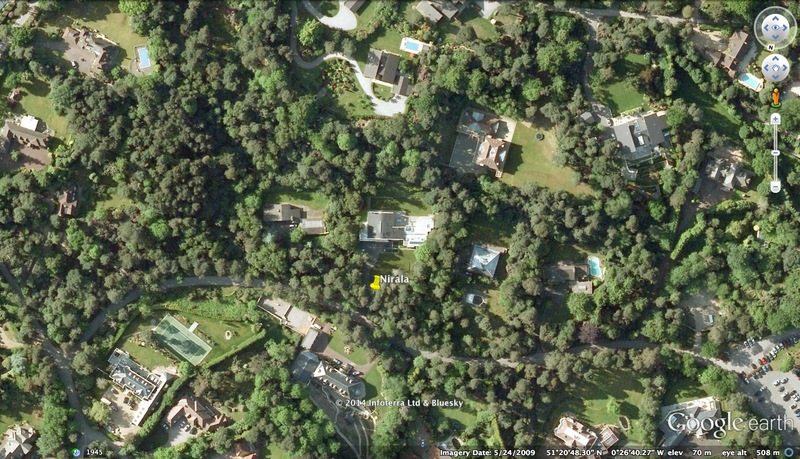 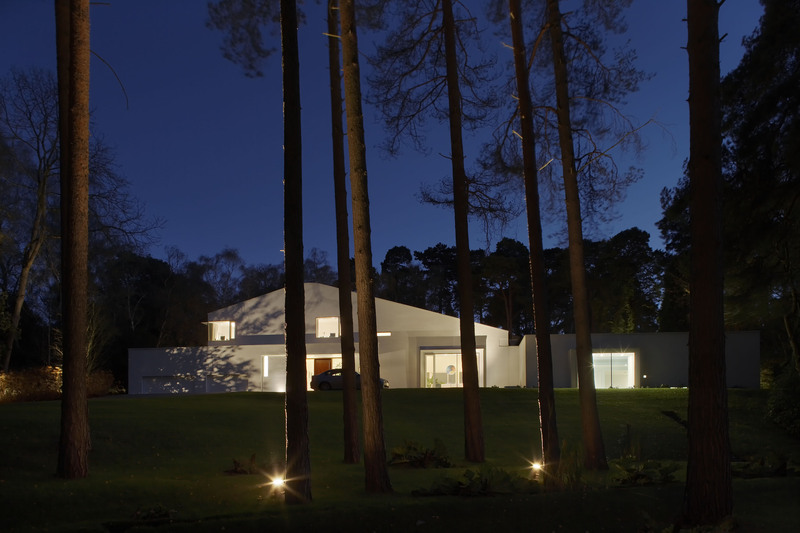 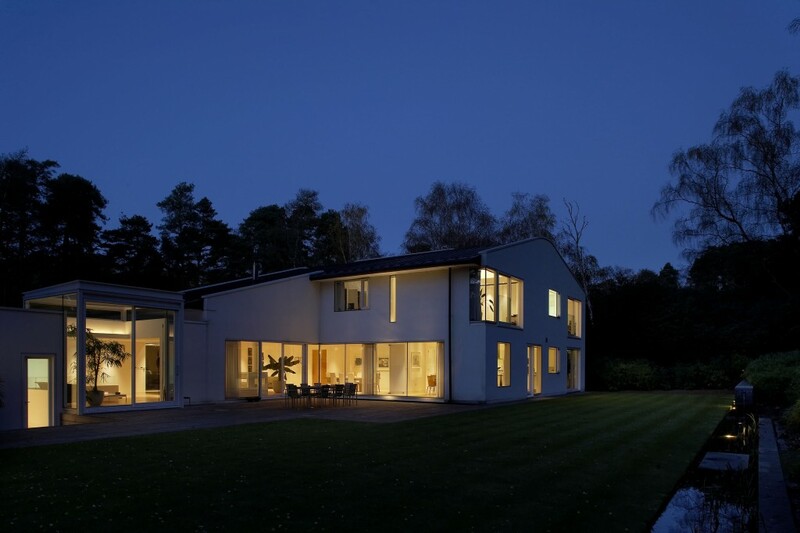 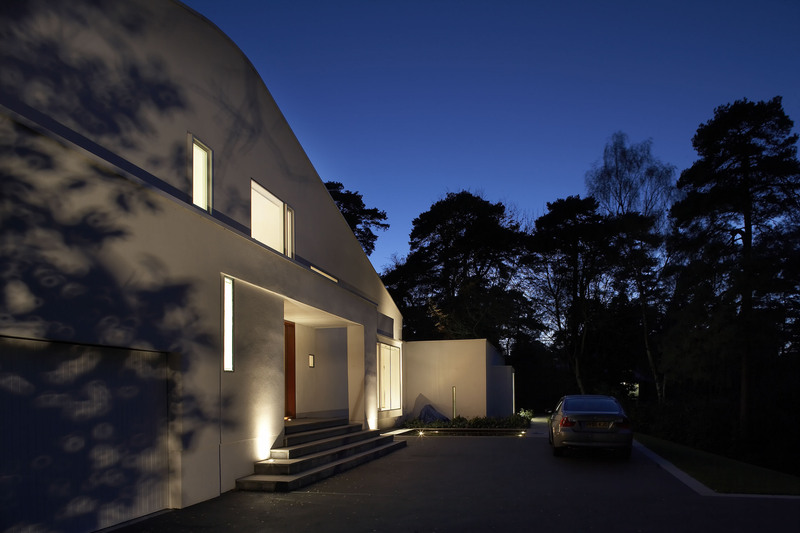 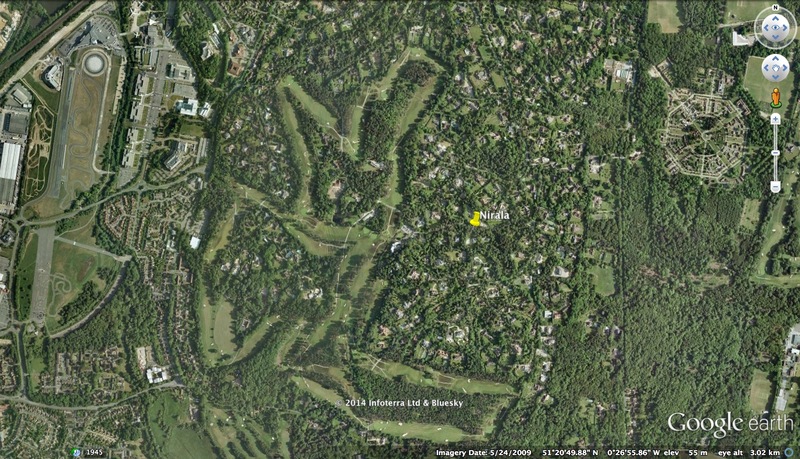 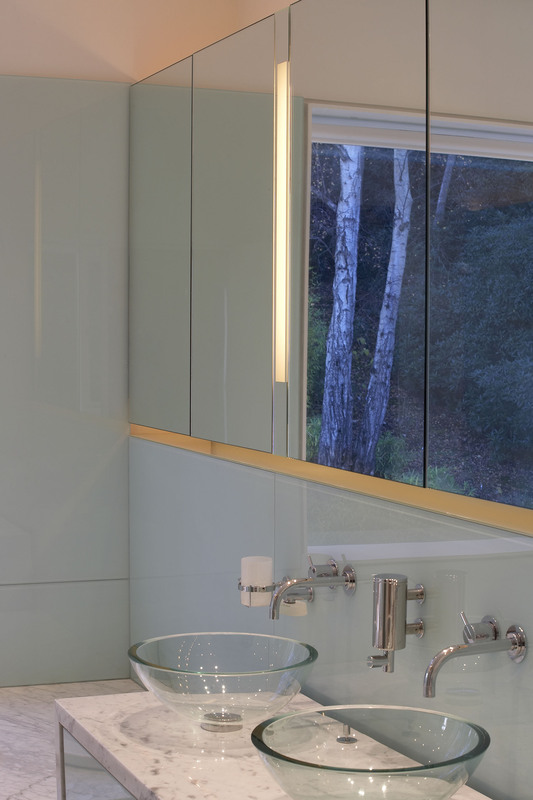 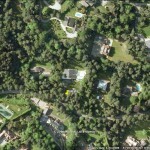 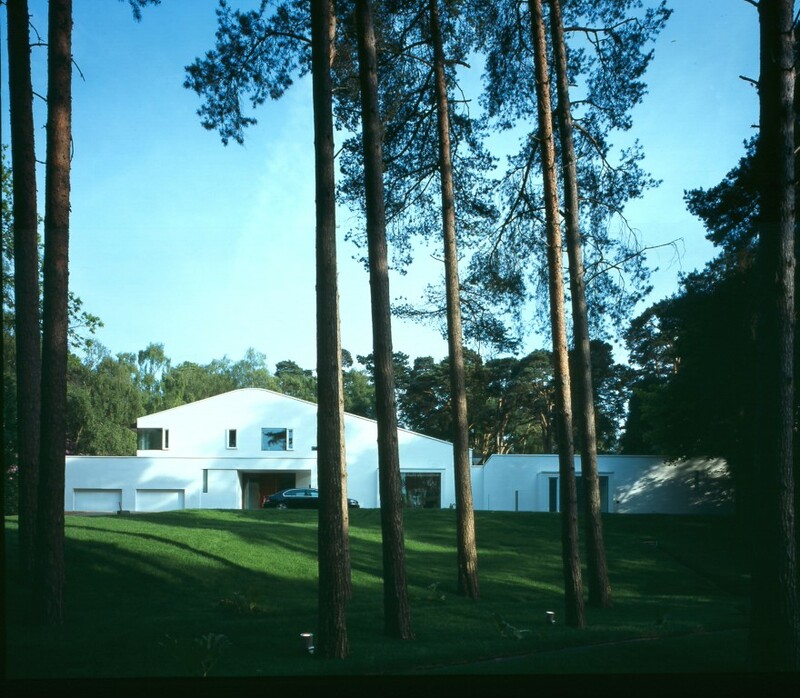 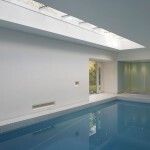 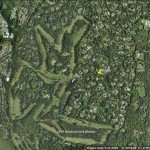 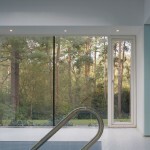 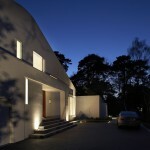 The house is set on the slopes of an old English estate called St George’s Hill on the outskirts of London. 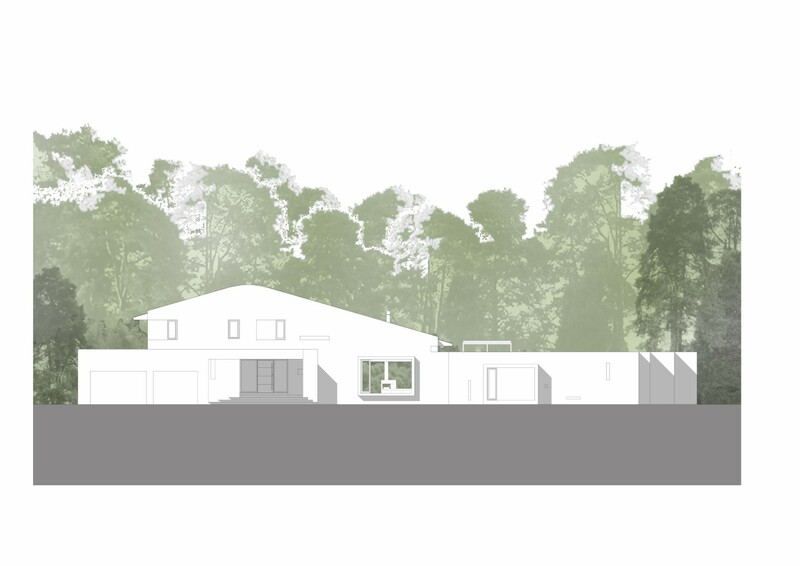 Surrounded by lush landscape of golf courses with great mature trees and rolling hills, the plan engages itself with the landscape seamlessly. 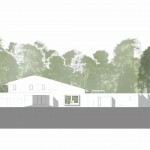 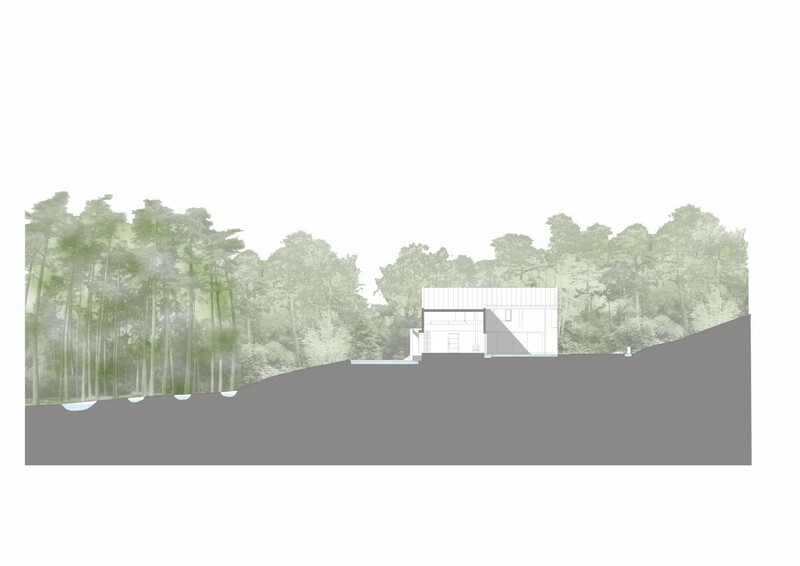 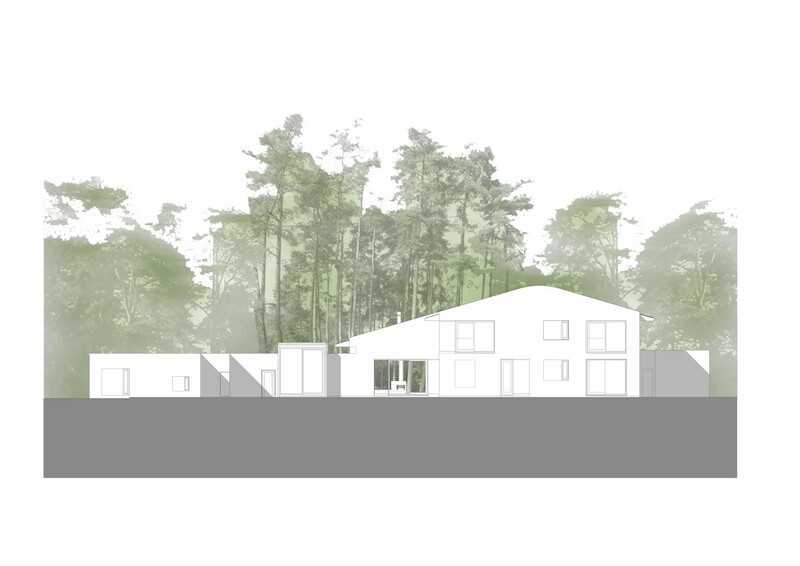 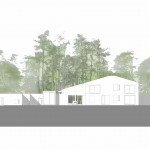 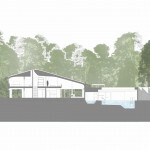 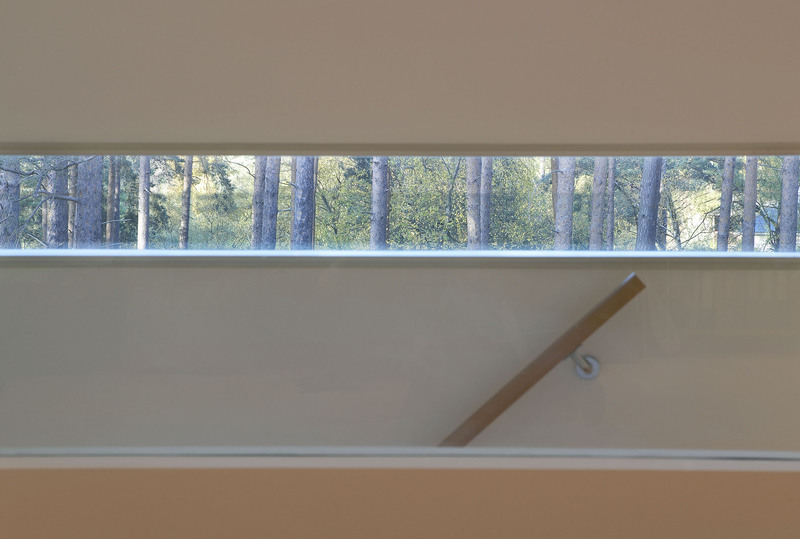 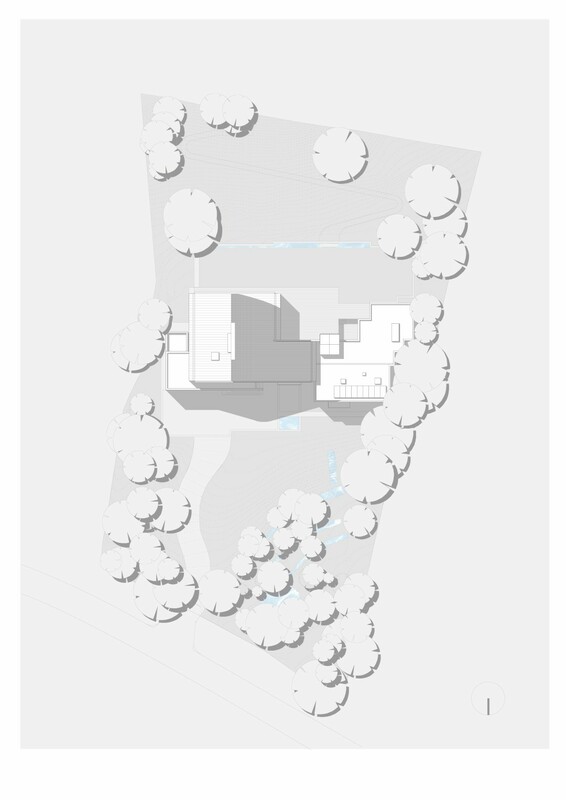 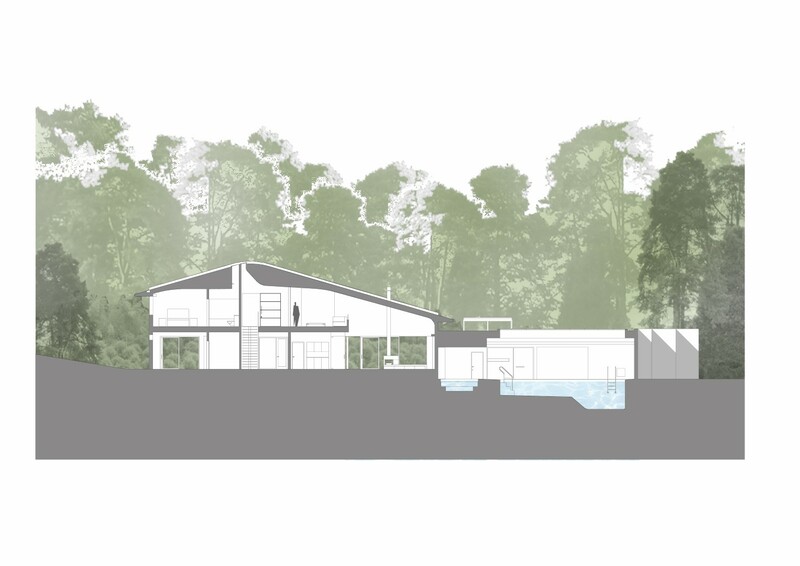 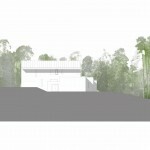 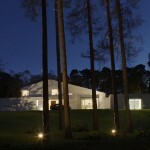 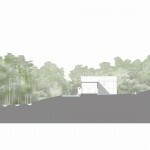 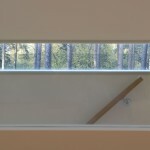 The house is set at a mid point on its site, which slopes down towards a smal stream along the road edge. 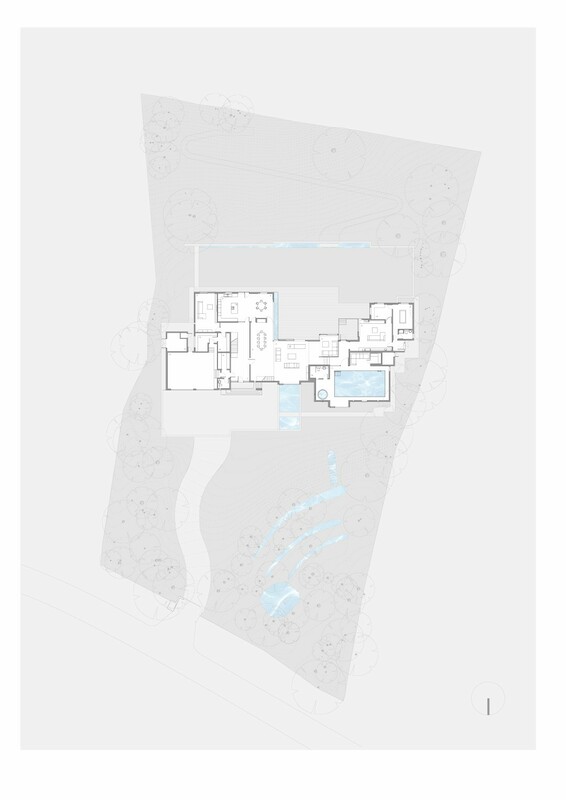 The natural water flow arising from the top of the site is collected in reflecting pools and allowed to pass below the house naturally to find its final course at the stream after it passes below Scotts Pines planted over a century ago. 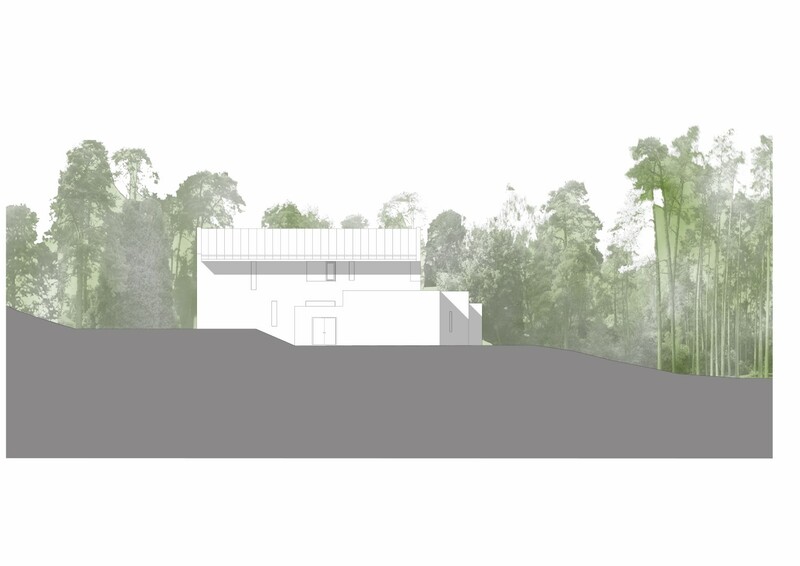 The steep landscape of the site is terraced at its middle where the boundaries between inside and outside become blurred. 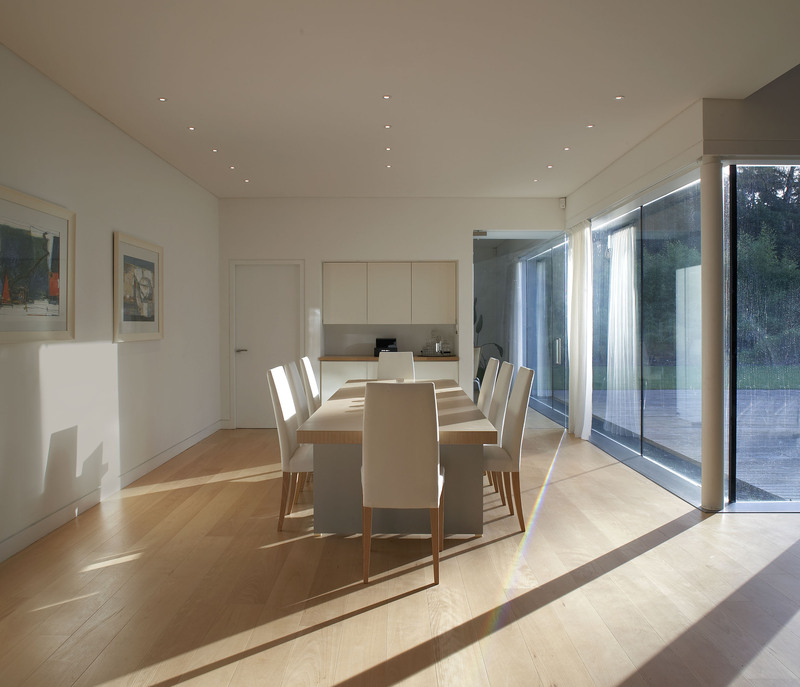 The interior living spaces open up fully to terraces of grass and timber to create this sense of boundarilessness. 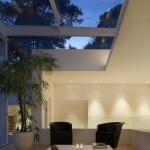 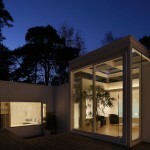 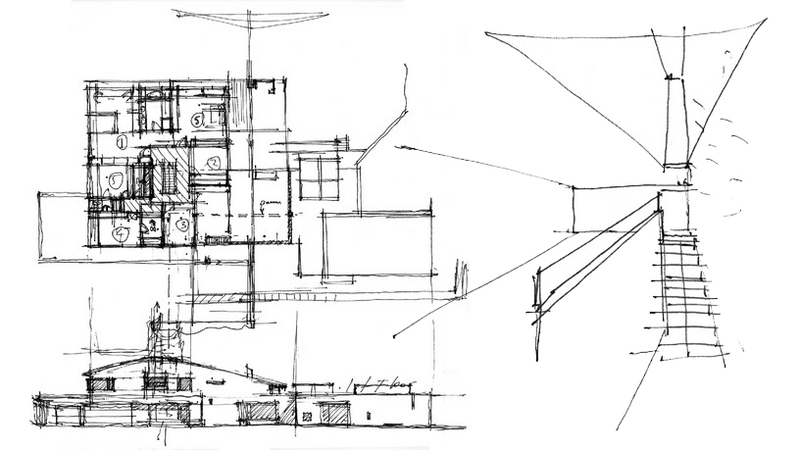 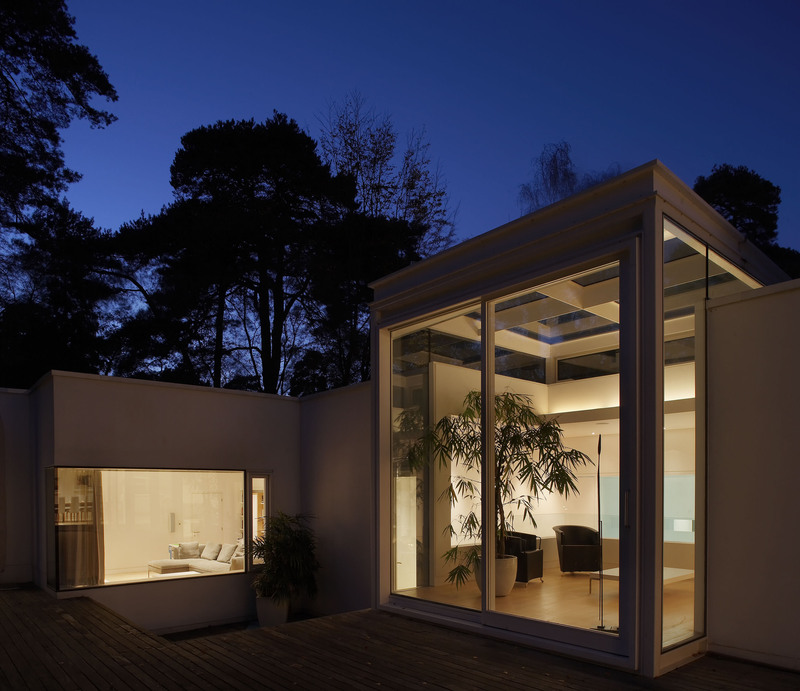 The form of the house on plan is derived from an earlier structure which was in its place previously. 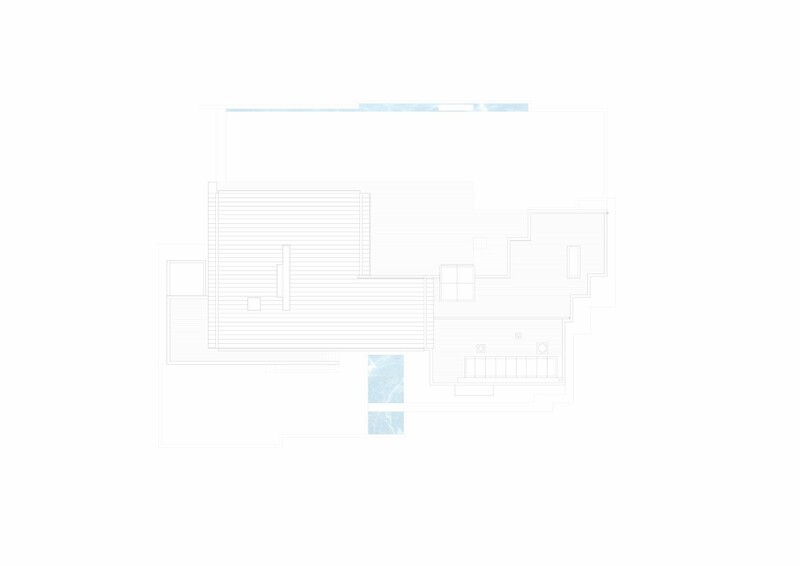 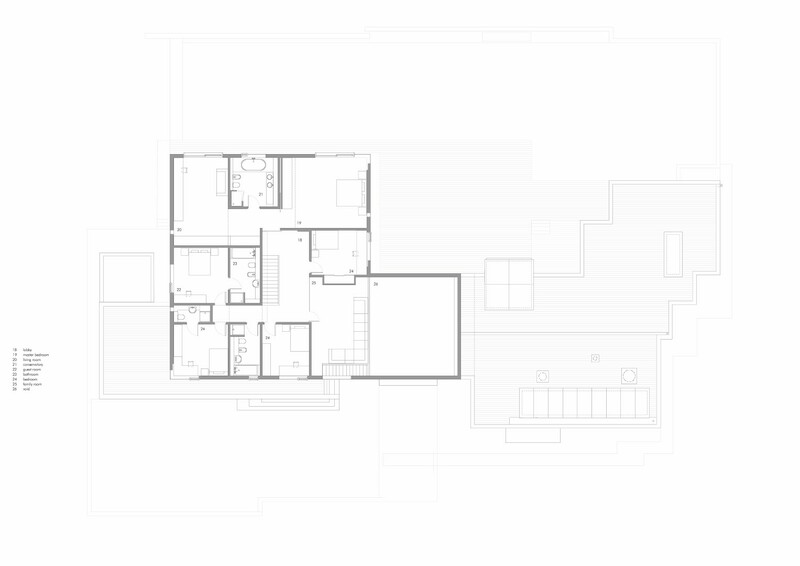 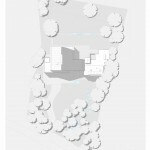 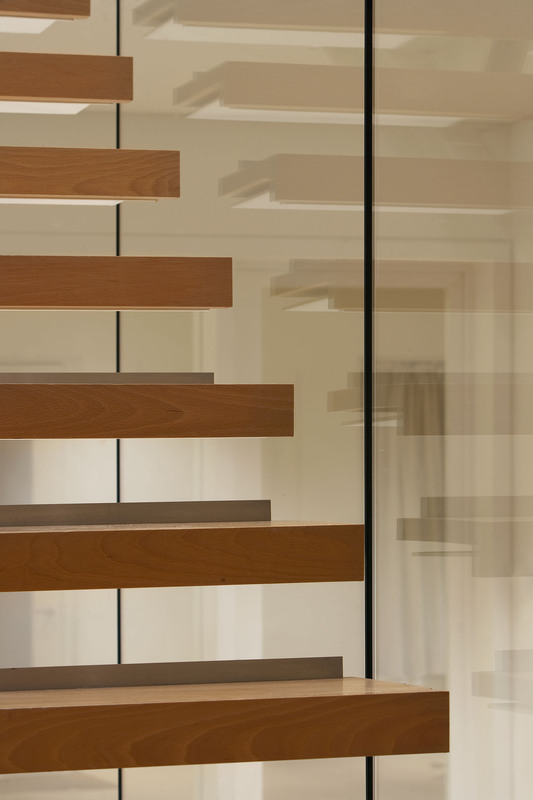 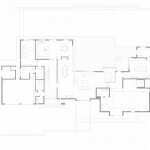 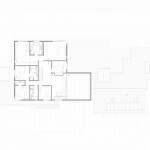 The plan is organised around a double height living space which connects through to the upper more private areas of the bedrooms through an upper living space / gallery. 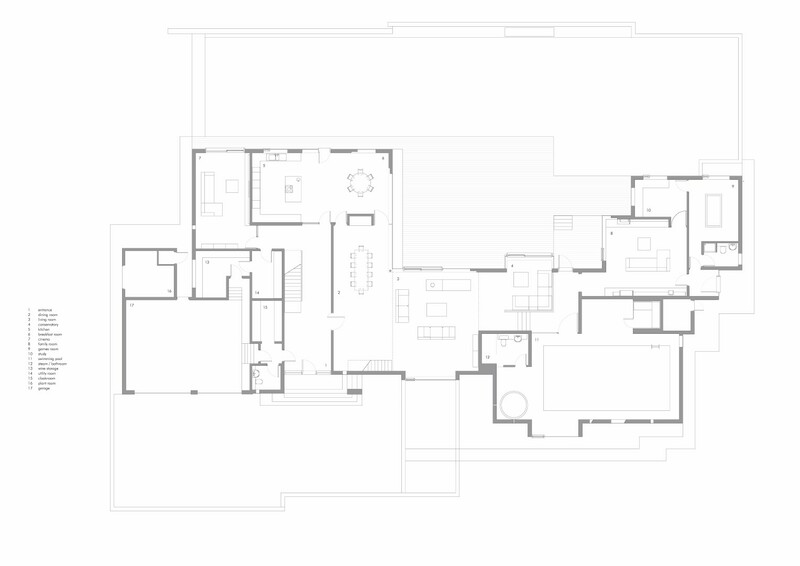 The main bedroom and study / dressing room captures in between the main bathroom, which all look out on to the private back garden. 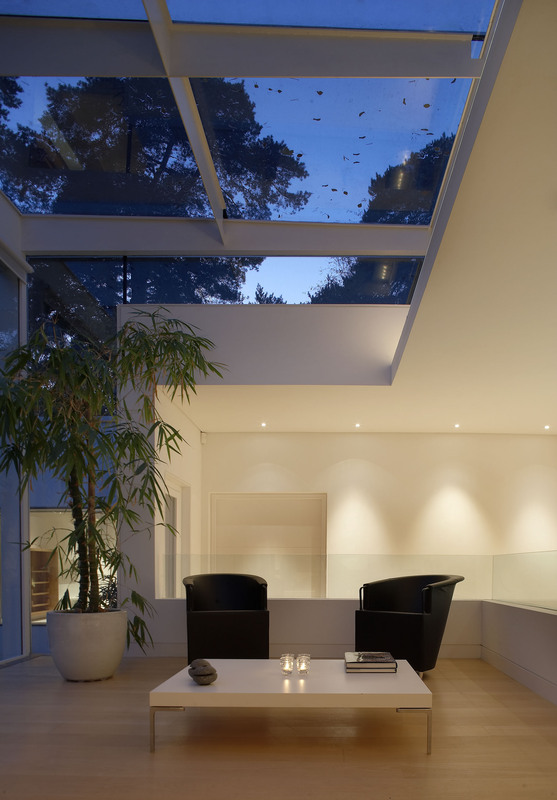 The sloping form of the roof is felt in all the upper spaces as well as the main living room, which rises at its peak to 6metres high. 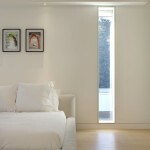 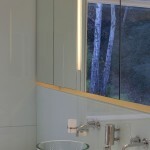 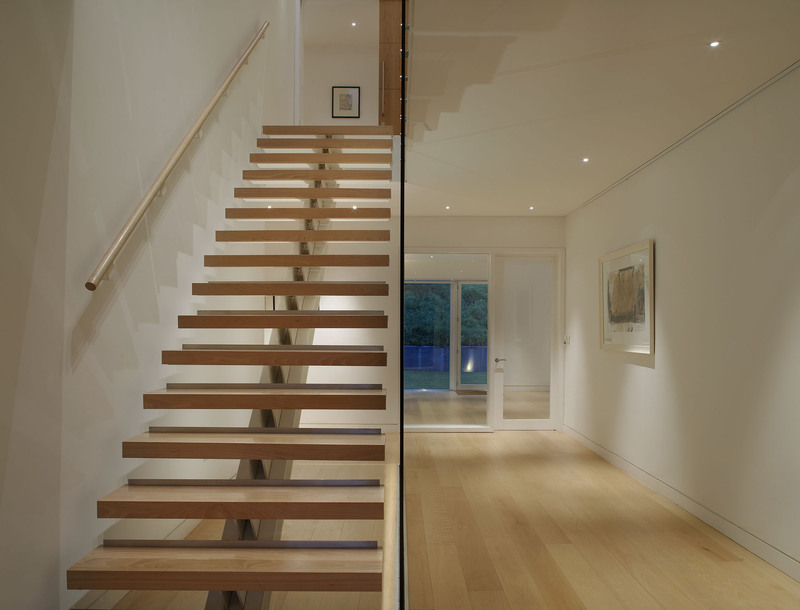 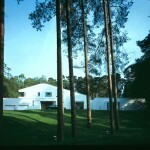 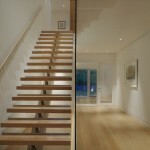 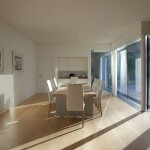 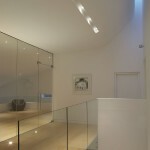 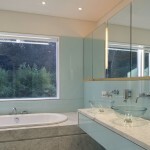 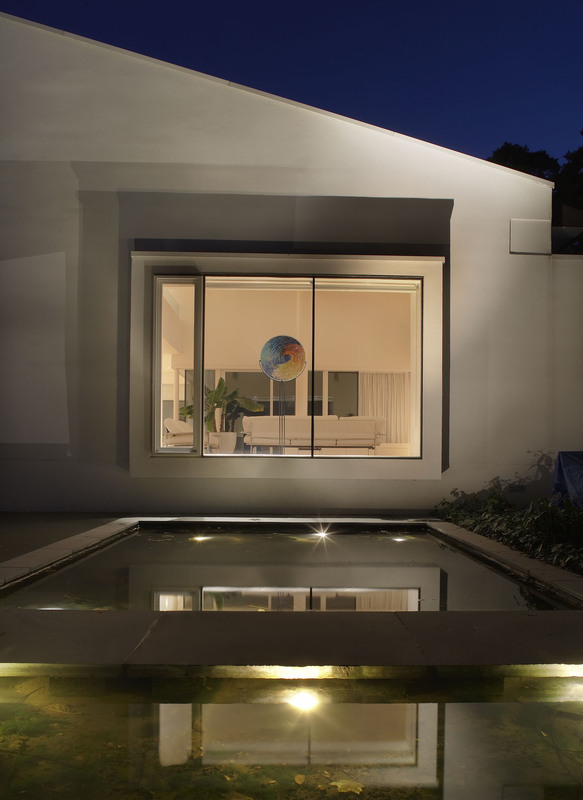 The client who is financier is also an art collector who saw the house as a kind of art gallery. 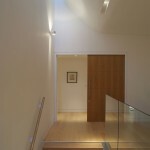 No colours are used there fore and the entry of natural light and positioning of lighting in general is optimised towards this end. 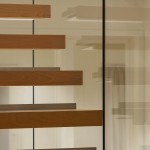 The only colours apart from the natural timber used in places, comes from the art objects themselves.